This is an extensive defense of the King James Bible and refutation of the modern versions. 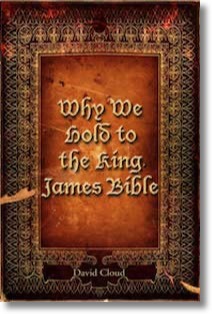 We examine five reasons for holding to the KJV: (1) because of the doctrine of divine preservation, which authenticates the Traditional Greek Text underlying the King James Bible, (2) because the theories of textual criticism supporting the Modern Greek Text are heretical, (3) because the modern texts and versions are a product of end-time apostasy, (4) because of the King James Bible’s superior doctrine, and (5) because of its unmatched heritage. The book contains an exposition of the doctrine of Bible preservation, documentation of the apostasy that enveloped the 19th century as modern textual criticism was devised, and documentation of the role played by Unitarians in the development of modern textual criticism. The book concludes with an exciting study on the history of the English Bible from Wycliffe to the 1611 KJV. If you are new to the Bible Version issue and want to understand it, we believe this is the book for you. Note: This is a "readers edition" of the book entitled "The Bible Version Issue" which is sold in the Advanced Bible Study Series. The text is set to a reading style rather than "outline" format and there are no review questions.